Both devices sports similar design and Fingerprint Scanner on Rear. Both Phones feature a 5.5-inch (1920 x 1080 pixels) Full HD Display Cool 1 is powered by a Octa-Core Snapdragon 652 processor whereas Redmi Note 3 is powered by a Snapdragon 650 processor. Cool 1 comes with 4GB RAM and 32GB storage compared to 2GB/3GB RAM and 16/32GB storage on Redmi Note 3. Coolpad Cool 1 comes with a 13MP dual rear cameras with dual-tone LED flash, f/2.0 aperture, PDAF and 8MP front facing camera on the other hand Redmi Note 3 has a 16MP rear camera and front facing camera both devices runs on Android Marshmallow. 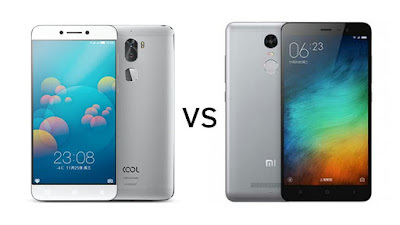 Cool 1 is packed with a 4000mAh battery whereas Redmi Note 3 has a 4050mAh battery. Coolpad Cool 1 is priced at Rs 13,999 in India . Redmi Note 3 2GB variant is priced at Rs 9,999 and 3GB variant cost Rs 11,999.